The PDR industrial rolling door fully comply with the requirements of EN 13241-1 and hold a TÜV-approval. The rolling doors have a high stability yet lightweight- about 10 kg/m², economical to maintain and extremely easy repair. greatly reduced running noise and outstanding heat insulation. 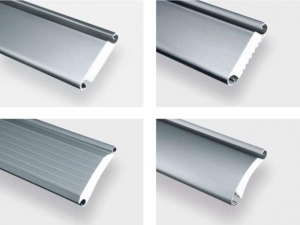 Our single-walled roller door profiles are available in galvanised steel, aluminium and stainless steel, colour coated upon request. They prove to be extremely robust and resistant to bending in every day use. 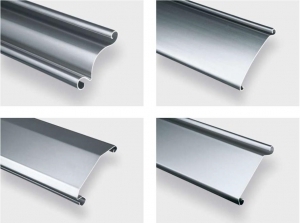 The selection includes curved and straight profiles in different materials and surfaces. We recommend our double-walled roller door profiles where requirements for smooth operation and insulating properties are higher. Depending upon model, they are provided with polystyrene foam, mineral wool or filled with polyurethane foam in a modern production process and satisfy the highest demands for stability, resistance and safety. They are also available in different materials and colour coatings. 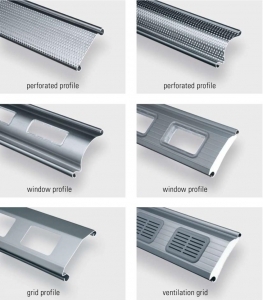 Most of the profiles in our product range are available in versions as perforated or window profiles or with grid cut-outs. In addition to better vision and ventilation, they also provide a visual lightening of the roller shutter. Existing roller door installations can be retrofitted accordingly or partially upgraded. The drive is a slip-on geared motor with integrated safety catch. It is sized according tot he dimensions of the door system. The drive can be installed on the right or the left. The industrial rolling door has a basic control system configured to press-and-hold to close/ press once to open. The plastic control box has a film keypad with Open-Stop-Close buttons. A CEE-plug (IP 54) is used to connect the power supply. Other door control configurations can be selected. A powerful microprocessor with inverter is available, providing smooth acceleration and soft braking to protect the materials as the door opens and closes. This allows the opening speed to be increases to 0.6 m/s. A stationary light barrier also prevents the door closing if there are people or objects in the way. Each door can be fitted with an electrically monitored bottom section (safety contact strip or advancing safety light barrier). If the door is less than 2,500 mm in height, an additional safety light barrier or a containment box will be necessary (option).